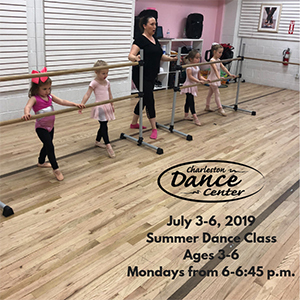 Our recreational summer dance classes provide a non-competitive environment designed to excite new dancers and to encourage year-round training for more experienced dancers. In addition to summer dance classes, we also provide several camp opportunities as well as sessions designed for our Just Dance! company dancers. Download a brochure with camp information. 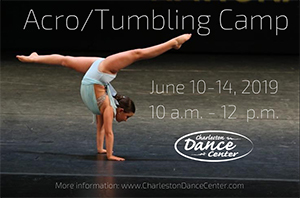 June 10-14, 2019 | 10 a.m. – 12 p.m.
For both the beginner and the advanced tumbler, this camp will be split by both age and skill level. Everything from the basics to advanced skills will be covered in this session. This is acro and tumbling for dancers, with an emphasis on learning how to transition skills from the tumbling equipment to a hard surface! July 8-29, 2019 (Mondays) | 6:00 – 6:45 p.m. This class is a great opportunity for your dancer to try out dance before enrolling for the whole season in the fall. Preschool classes include ballet, tap and tumbling fundamentals while learning basic dance terminology, musicality, tuning gross & fine motor skills, proper class etiquette and most of all, FUN!!!! 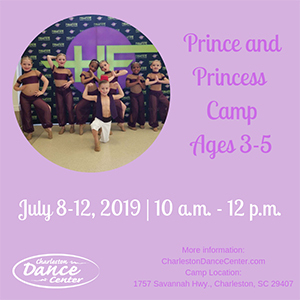 July 8-12, 2019 | 10 a.m. – 12 p.m.
Imaginations will soar as our youngest dancers experience dance camp as a prince and princess! Campers will learn the fundamentals of ballet, tap and tumbling and enjoy arts and crafts and snacks each day! If you are considering auditioning for Just Dance! Company or Collective, we invite you to join us for a pre-audition clinic. 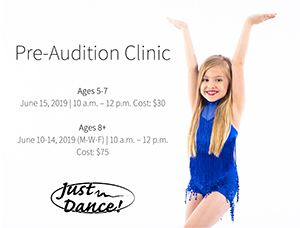 The goal of the clinic is to help new dancers feel more comfortable during auditions and understand what it would be like to be part of Just Dance! At the clinic, the dancers will learn more about Company and Collective, about the audition process and practice the types of skills that will be part of the audition. Our Summer Intensives are open to all dancers with previous dance experience and are designed to push dancers to the next level, with classes in Ballet, Jazz, Tap, Contemporary, Improvisation, Hip Hop, Pointe, Variations, and more! All Just Dance! Company members are required to attend Summer Intensives. This all day format will challenge even our most experienced dancers! All dancers with previous experience are welcome to join our Mini Mini Company for Summer Intensives. This introductory level program will provide classes in Jazz, Ballet, Tap, Contemporary, and Tumbling. It is a great introduction into new styles, and a wonderful training platform for these young dancers. There will be breaks to allow for a snacks and water! The Collective Boot Camp is open to all dancers with previous dance experience and is designed to be a fun introduction to the season with high level instruction in multiple dance formats. All Just Dance! Collective members are required to attend Boot Camp.